If the country specified in the profile of a customer fits any localization specified in the administration panel, the parameters will be displayed according to the settings of the localization. In case it doesn't, create new one. Name – type the name of localization in the Name input field. Default – tick this check-box, if you want the localization to be selected for cases when it's not possible to define the localization of a customer by a country, IP address, cookies. Use custom weight settings - tick this check-box if you want custom weight settings to be used. Grams in the unit of weight defined by the weight symbol - type the necessary value. Clicking on the <- button will move it to the left box Selected items. Click on the Create (if adding) or the Save button (if editing). 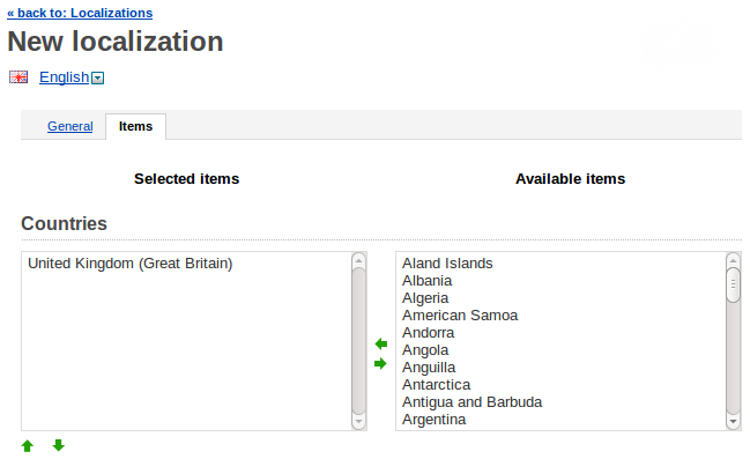 After you have created a localization, choose it in the Localization option on the details pages of the desired products, categories, shippings (destinations), payments, pages, ads and news in your administration pane in order to display them for customers from the address selected for the localization. "You mention at the end that I can choose a Localization for destination! How is that? As I am facing a problem that certain products can't be shipped to certain countries! I know I can hide the product with localization, but what if someone decides to buy it from a different country and ships it to another country (the one that I can't ship that certain product to)? "Check that off the list of things I was cnofseud about."